Notice how the angel-trombonist appears to be swooping down to play for the people below. I recently added this picture and caption to the Trombone History Timeline (17th century—1st half). For another painting in a Milan church by the same artist, see here and 1617 of the Timeline. 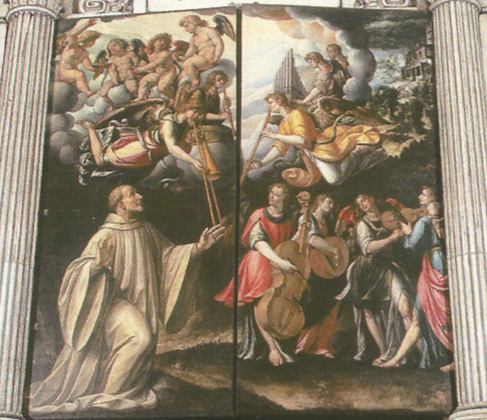 1615—Milan, Italy: Bartolomeo Roverio’s painting at Santa Maria church, Chiaravalle Abbey, features an angel-trombonist among a number of other angel-musicians (see below image; public domain) (Die bemalten Orgelflügel 360).